With 22 races in the books, the pressure is weighing heavily on a multitude of NASCAR Sprint Cup teams as the series arrives for their second yearly visit to the Irish Hills of Michigan. 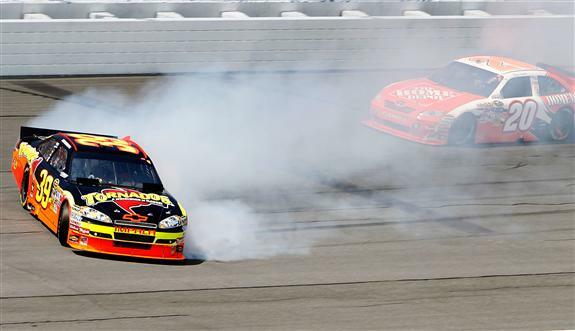 As 43 cars were led to the start of the Carfax 400 at Michigan International Speedway, Kevin Harvick's 2010 season had been the year NASCAR race fans were long expecting from the driver who took over the vehicles of Dale Earnhardt Sr ten seasons ago. Leading the points ahead of Hendrick Motorsports pair of Jeff Gordon and Jimmie Johnson as well as the highly-energized Penske Racing lead veteran driver Kurt Busch, Harvick and Richard Childress Racing are riding high heading into the Chase for the NASCAR Sprint Cup. On the other side of the points, several drivers such as Ryan Newman, Dale Earnhardt Jr and Jamie McMurray are on the outside of the top-12 Chase positions with Michigan being the 4th to last opportunity to gain valuable ground. Polesitter Kasey Kahne driving the #9 Budweiser Ford was quickly dethroned from the top spot by a strong start from the #48 Lowes Chevrolet of Jimmie Johnson.Surprising in the light of Jimmie Johnson's NASCAR Sprint Cup career, Johnson has been winless in 19 previous races at Michigan International Speedway. Leading the Carfax 400's first 14 laps, Johnson's luck would not change at the race track. By lap 15, Johnson was hunted by the #16 Ford of Greg Biffle and passed for the 1st place position. With a history of good finishes at Michigan, Biffle was a definite presence through the first half of the Carfax 400 race. Returning to the NASCAR Sprint Cup race track for the first time since his private jet crash, Roush-Fenway Racing's founder Jack Roush witnessed first-hand the improving state of his Ford Fusions in competition. Calmly, the first 200 miles of the race resulted in two cautions. The initial yellow flag was thrown for oil spewing from the blown engine of Kurt Busch's Dodge. Back-sliding 6 spots in the 2010 driver's point standings, Kurt Busch lost touch with the top half of the Chase but is still holds a 180 point cushion on 12th place Clint Bowyer. Compounded by poor finishes of Busch's teammate, the Carfax 400 was a tough day for Penske Racing. A track Penske Racing team owner Roger Penske within his business portfolio, the best race result from the 3-car team was 32rd for Sam Hornish Jr.
Ending Greg Biffle's stint in the lead after the #16 Ford led 3 times for 66 laps, Tony Stewart's #14 Chevy took over in front through the midpoint of the Carfax 400. Handing off the lead briefly over a pit stop, Stewart's rear-view mirror filled with the #29 Chevrolet of Kevin Harvick. Taking the lead for lap 111, Harvick stayed out in front for the longest consecutive period in the Michigan race. On the latter side of Kevin Harvick's 45-lap stint, a series of two-car incidents occurred to bring out yellows. Both conflicts residing in turn 4, Ryan Newman was first spun out with assistance coming from the Home Depot #20 of Joey Logano. After the race, Newman angrily confronted Logano over the lap 149 contact. With one Chase contender involved in the lap 149 caution, top 12 drivers Jeff Gordon and Jeff Burton wound up with damaged cars just 6 laps later. Running solidly in the top-10 up to that stage in the Carfax 400, Burton ended the race 24th while Gordon would find himself 27th in the final running order. In a final caution for debris on lap 169, teams had three laps to plan for their final run. Opting for the superior control of new tires, Greg Biffle led a contingent to pit road while Tony Stewart, Denny Hamlin, Kevin Harvick and a few others chanced track position being more valuable. While Stewart led off the restart for 11 laps, his fast-moving former teammate Denny Hamlin flew by to lead lap 178. A different circumstance to the dominant (yet arguably boring to watch) performance in the June race, the #11 FedEx Toyota started buried in the back after the Joe Gibbs Racing team elected to switch to a back-up car. Denny Hamlin would lead 12 laps under the hot pursuit of the #29 Chevy. Kevin Harvick ate into the small interval to Hamlin up until he was able to make his winning move on lap 190. As the choice to stay out proved to be the winning decision for Kevin Harvick, Greg Biffle was able to charge to only 4th place at the end one position behind the #99 Ford driven by teammate Carl Edwards. With Matt Kenseth behind Biffle in 5th, Roush-Fenway Racing delivered 3 cars home in the top-5 motivated by their team owner's presence. Also having inspiring runs at the end was Martin Truex Jr 8th in the #56 NAPA Toyota and Elliott Sadler who brought his #19 Ford across for 9th place. Truex Jr overcome early difficulties having suddenly lost several positions early in the Carfax 400. When selecting NASCAR Sprint Cup championship contenders at the beginning of the year, no one mention forwarded the possibility of Kevin Harvick leading the points following 23 races. Thanks to his victory in the Carfax 400, Kevin Harvick now leads by 293 points over Jeff Gordon with a Chase opportunity all-but guaranteed.